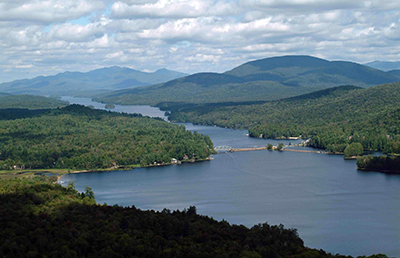 This trek follows both secluded and the well-traveled routes of the Raquette River and tends to be more difficult, mostly due to a couple of strenuous carries. This is a 50 Miler if you get dropped off at Buttermilk Falls. Get dropped off at the state boat launch, just north of the town of Long Lake, or at the southern end of Long Lake at Buttermilk Falls. Head north, staying to the eastern or western edge to avoid traffic. Camp at the northern end of the lake at Plumbley’s Landing, Rodney Pt., or just on the Raquette River at Lost Channel. Head down the Raquette (north) towards Raquette Falls. Take the carry around the falls on the eastern bank. The carry is a mostly downhill, pretty wide and well worn. Continue north on the Raquette, heading for your second night at the campsites north of the falls, or even up into Stoney Creek Ponds. Push off and head for the Indian Carry from the Stoney Creek Ponds into Upper Saranac. The first half of this carry is hilly, muddy, narrow, and crosses Highway 3, so be careful and stay together. Head north on Upper Saranac Lake, watching for motorboats. Some good campsites for the night are on Buck Island, Green Island, in Saginaw Bay on Upper Saranac Lake, or on to Follensby Clear Pond. Head back towards camp through Fish Creek Ponds. There is a picnic area available at Fish Creek Public Campground with fresh water and flush toilets. Continue into Little Square Pond and then into Floodwood Pond. This is a good location for advancement activities. The numerous trails in the area also provide opportunities for hiking. Paddle back into Rollins Pond and prepare for a day of in-camp activities.